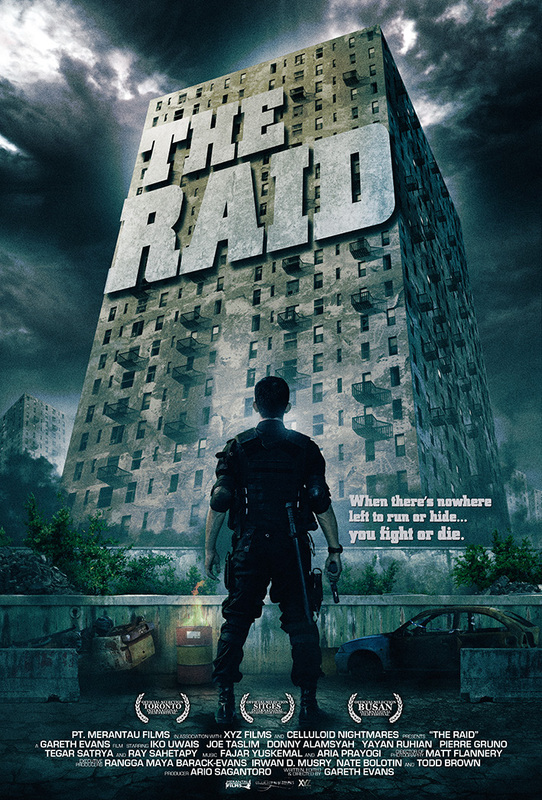 The Raid Review (TIFF 2011) – Iko Uwais is going to own you! Midnight Madness kicked off last night with Indonesia’s The Raid, which looked to have all the makings of a high paced action film. Director Gareth Evans and rising Indonesian action star Iko Uwais had previously worked together on Merantau, the story of a young man’s journey from his hometown village to the big city, and his fight against black market goons specializing in selling young women. I had recently enjoyed Merantau and was very excited for the second offering from Evans and Uwais. It was quite shocking during the introduction to The Raid, when some of the cast and crew were brought onstage and the microphone was passed to a young boy claiming to be the 28 year old Iko Uwais. Dressed in jeans and sneakers, standing about five foot two, Uwais was very unimposing on stage. However, that is not the case on film. In The Raid, Uwais is a no nonsense killing machine, and his hobby appears to be kicking people in the head, rendering all of their major joints useless, kicking them in the face and then shooting them in the neck. Did I mention that he is one of the good guys? The Raid begins quickly, with a nervous Rama (Uwais) leaving his pregnant wife for a police assignment. Rama and a group of 20 or so other officers will be infiltrating an apartment complex, in order to take down one of Jakarta’s most notorious criminals. We are introduced to the main villain and begin to understand just how villainous he is, as he executes five men on screen, four with a handgun, only to run out of bullets and casually opt for a hammer to finish off the last man. The police officers surreptitiously get into the heart of the complex and are about to push on, when the lights are turned off and a loud speaker, which can be heard throughout the whole complex, casually informs the apartment tenants that anyone who kills a police officer will get free rent for life. Out of the woodwork comes a ‘who’s who’ of neighbours from hell; drug dealers, killers, and the mentally deranged, all of them armed to the teeth. A firefight ensues and the officers find their numbers greatly reduced. The fate of the remaining officers lies in the hands of the rookie cop, but expert combatant, Rama. I hope I don’t gush too much, but I absolutely loved The Raid! Sure, seeing the movie at a film festival on opening night and listening to the crew must add some excitement to the experience, but I can’t recall ever seeing an action movie like The Raid. I went in expecting a martial arts film with a few thrills, but I was way off. The Raid is a claustrophobic, relentless, ultra-violent action film that had me on the edge of my seat, when I wasn’t cowering in it. There is no doubt in my mind that Iko Uwais is the next action star waiting to take the world by storm. Uwais’ success is a combination of his onscreen charisma and his expertise in Silat, an Indonesian martial arts style, which is a combination of lightening fast palm strikes, joint manipulations and throws. At the beginning of the film, Uwais unleashes a flurry of Silat blows on a punching bag. The crowd erupted in applause, hungry for more. It wasn’t even a person, just a punching bag. That’s how good this guy is! The entire film was masterfully choreographed by Uwais and Yayan Ruhian (who also plays the very unsettling villain named Maddog). The sound effects and score are perfect for the claustrophobic and frenetic pace of the film. I haven’t heard bone crunching sound effects this good since The Brotherhood of the Wolf. Also, the score adds to the madness of the fight scenes, as the music often rises to a menacing crescendo near the end of important brawls. I don’t want to compare Iko Uwais to Tony Jaa, because they bring very different things to action cinema, but one inevitable comparision is that they both bring refreshing style and buckets of talent to the bigscreen, something that the action film world sorely needs. I hope that the director, Gareth Evans, and Uwais team up for at least one more film. I can only imagine what success lies down the road for both of them if they stick together. They are a deadly duo. I could go on about The Raid, but really, you need to just get out there and see it. If TIFF tickets are still available, then seek them out. Otherwise you will have to wait until 2012 to see The Raid, and that would be such a shame. Also, Uwais might come to your house and break your face. TIFF 2011 – Just Around the Corner! This is Merantau on steroids. It really is that good. Some reviewers are calling it the best action movie of the year, and I can’t say I disagree with them. I would watch it again right now if I could. Sweet write up Matt. I couldn’t vouch for this movie more, myself. I’ve been talking about it all day with friends and colleagues at work. Love this movie! Good job on not giving much away and still celebrating it’s awesomeness. I’m glad we made it out. I don’t think midnight madness movies get much better than that! Thanks for the link! That trailer really does a great job of communicating the nature of The Raid. At the same time, I would have been disappointed to see this before the film as it would have taken away much of the surprise. However, I’m sure there will be many readers who will appreciate this link. They will 😀 Actually Gareth has teaser for his earlier project called ‘Berandal’ (look it up on YouTube) but then The Raid project came along and he has to postponed Berandal.